So you looking for ways to promote your blog posts? A lot of people still think if you build it, they will come. That statement may be true a couple of years ago when there was less competition on the Internet. Today it’s not enough to just publish great content, cross your fingers and hope for the best. You’ll have to do more than that to get noticed. But what if you have only a handful or even no followers to begin with? Can you still promote your content effectively? In this post, you’ll learn how to leverage the social media channels and several marketing tools to promote your content when you have only a few or no followers. When it comes to content marketing, some people suggest that you should be spending 20% of your time creating content and the other 80% should be spent on promoting it. This is crucial especially when you are just starting out because nobody knows you exist. The only way for you to get more visitors to your blog is via content promotion. But I know it’s often hard to spend less time writing especially if you are not a fast or a talented writer. As a non-native English speaker myself, I probably spend around 30% of my time writing content because I just need to take extra care to make sure my sentences or grammar make sense. And I am still trying to get better at this lol! I also prefer creating long-form content so it’s not possible for me to just whip a blog post in a day and be done with it. Now let’s go through each of the blog promotion methods. There’s a lot of social media networks out there so it can be a challenge to pick the right one to start with. Find your strength and spend more time on those which will likely provide you the best ROI. Don’t try to be in all of them as you’ll spread yourself too thin. Don’t be jack of all trades, master of none. Check out Neil Patel’s video below to give you some ideas if you are new. YouTube works well for both B2B and B2C and it will also give you a long term traffic if your videos ranked well. Get this: you can have huge success on Pinterest even if you don’t have large followers. On Pinterest, the number of followers you have doesn’t matter. If you are not familiar with Pinterest, it’s a social media platform that allows you to discover and share content. Although it works more like a search engine than a social media platform. In fact, it’s one of the world’s largest search engines. As of Sept 2017, Pinterest has more than 200 million active monthly users. Pinterest users spend twice as much as those referred by Facebook. From my personal experience, visitors from Pinterest spend more time on my blog and view more pages per visit. The half-life of a pin is 3.5 months. That means the pin you create today will continue to bring in the traffic a couple of months down the road. Just registering and pinning your posts won’t suddenly bring a torrent of visitors though. You need to have a Pinterest strategy. For that, I am using Tailwind to help me schedule my pins out and it has been a tremendous help. I started with only a handful of followers (fewer than 20) yet my pins reach extends much further beyond the 20 followers. Currently I have over 60,000 monthly reach, just after one month of actively using Pinterest. You’ll never get this kind of reach via a Facebook page with a small number of followers, it’s mind boggling! Get Tailwind here. You get to pin 100 pins per month for free, forever. There’re paid plans available that allow you to pin more. For a start, I’d recommend you to give the free version a try. To do this, I recommend using BuzzSumo. 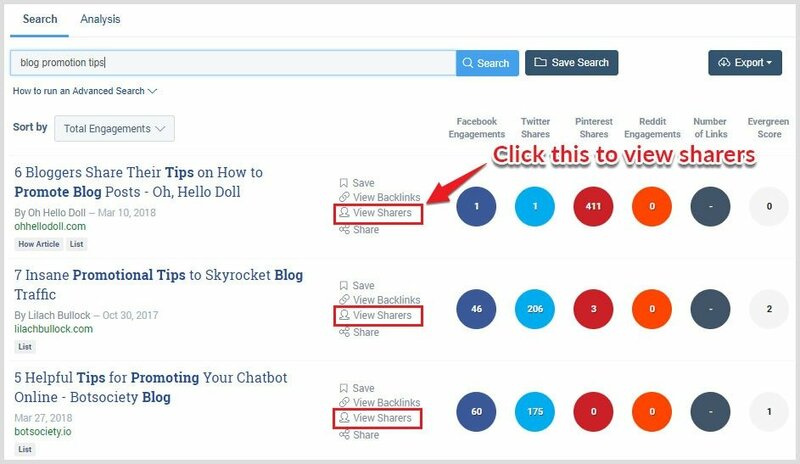 BuzzSumo helps you to find the most shared content on the social media channels and influencers related to particular topics. Because it allows you to find people and influencers who are more willing to share your content on their social media account since they have already shared similar content in the past. You can also write similar articles about the most shared topic because you already know these topics are already trending. Here’s how you find people who are more likely to share your content. Go to BuzzSumo and type in whatever your keyword is. Scroll down the list of posts and find one that is the most relevant and has a lot of shares. Then, click on the View Sharers. For example, when I searched for “blog promotion tips” the follow results came up. All I needed to do next was to find the most relevant articles to my own blog post and then clicked View Sharers. The next page will show a list of people who have shared that specific post. You can even sort the list by the number of followers. While you can approach them via their Twitter handles, the best way to get their attention is through email. You can find this information on their website. Keep in mind that this is a numbers game so the more people you contact the better. Not everyone will respond or will be willing to share your content. But those who do share may have thousands of followers. So, whenever an influencer is involved there’s a higher chance your content will go viral. Emailing each person can be tedious so you may want to automate the process or find an affordable virtual assistant from places like Fiverr. Because you may want to contact over 50, 100 or more people to get the best result. I thought it was pretty great myself. Anyway, I’ve just published a similar article that expanded on that article and I thought you might like it. Notice that you don’t give out the link right away. You are asking for their permission before you send them the link. The reason is that if they reply and show an interest, you’ll increase your chance of getting your blog post shared. For a new blog with a small number of followers, adding the social media sharing buttons makes it easy for your visitors to share your content. The share count acts as a social proof which will encourage others to share your content since they see other people are sharing it already. Create Click to Tweet box easily within your content as you can see below. Previously, to get all these features, I had to install several separate plugins. I’m trying to reduce the number of plugins installed as this can improve the performance and security of your blog. 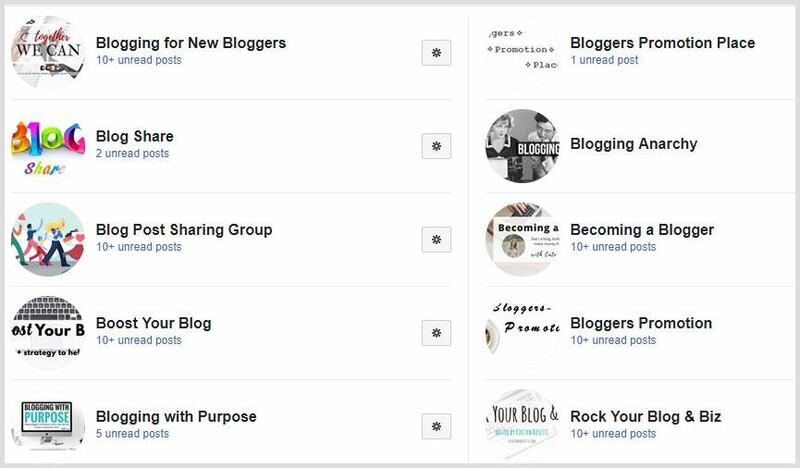 Because this post is about ways to promote your blog posts when you have no followers, joining relevant Facebook groups can be one of the most effective ways to get your content in front of a larger audience. While you may not likely get hundreds of visitors immediately from Facebook groups, they can be a source of targeted traffic that will engage with your content. One downside of Facebook promotion is that you need to keep on promoting your content. The average half-life of a Facebook post is about 30 minutes, that is the length of time it takes for content to reach 50% of its total lifetime engagement. That’s circa 2013, today it might be even more dismal with each Facebook algorithm update. But don’t let that data discourage you because many have found that promoting on Facebook groups will definitely get that ball rolling. I’ve dedicated an entire post where I shared the ins and outs of how to use Facebook groups effectively. I am currently tracking every single link I posted on Facebook using Google Analytics. I’ve been doing this for about a month now. The goal is to find out which Facebook groups bring in the most traffic and also the most newsletter subscribers. You can see the exact method that I’m using at the bottom of that post above. Once I have enough data, I’ll share my finding on this blog. Why should you schedule your posting on the social media? Save time. You don’t have to spend hours in front of your computer all day long leaving you more time to connect with your followers and to create more amazing content. Optimize your posts engagement. The ability to schedule content in advance means you can post at ideal times for maximum likes, comments and shares. Increase reach. Social media scheduling helps you reach more people as it allows you to promote your blog posts on a consistent basis. You can start by using Buffer for social media scheduling. Buffer is pretty easy to use and is beginners friendly. The free version allows you ten scheduled posts at a time across multiple social accounts. I am using Buffer to schedule posts to Twitter, Facebook group and Facebook page that I am an admin. You can even install the browser extension to schedule any posts you encounter while browsing online. In addition, I also like Hootsuite and RecurPost. RecurPost is good if your content is evergreen, as it helps you publish your posts over time. I use it to cycle through all my posts on Twitter. Also, I am using Buffer in combination with Feedly for content curation. 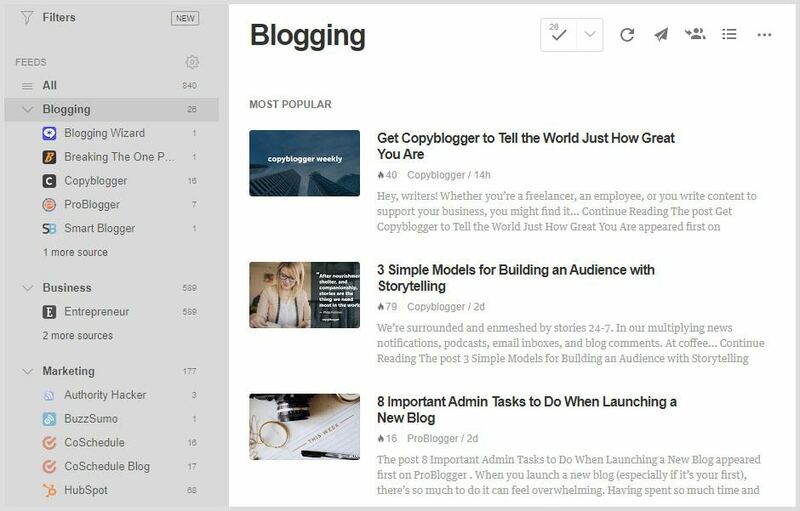 Feedly is a feed reader which offers an easy way to aggregate your information feeds (the blogs that you are following) in one place. When I find an interesting content that I want to share, I just hit the Buffer button right from the app and it will be added into my Buffer schedule. When you write a blog post, try to link out to relevant sources. However, you don’t want to just shove up the links for the sake of it. They need to be useful and add value to your content. As you do this, you’ll get on people’s radar. This builds incentives for them to engage with you. By putting them first it shows trust. You’ll earn their goodwill even before starting your outreach. Get to know them first, try to provide value before asking them for help. Once you hit the publish button, shoot them an email or tweet that person and let them know about it. Email often works better than just tweeting it at them because it’s more personal. I enjoy your work and find it very useful, I even linked out to you in my latest blog post. It’s important not to push them to share, just give them a heads up and explain why you mentioned them. If your content is good enough they may start sharing it on the social media exposing your content to a wider audience which can drive more traffic to your post. Do you know what’s the worst thing that can happen when it comes to getting people to visit your blog? It is not having opt-in forms installed to collect their emails! There’s no excuse not to start your own email list today. Imagine if all of the traffic sources suddenly stop sending you traffic overnight. Your business will suffer and all your effort trying to create quality content will go to waste. If you have an email list, you can continue to promote your content to the people on your list, build a relationship and sell stuff to them even with zero traffic or no website! Your email list is one of the most important assets you’ll ever have as a blogger or site owner. There you have it, 9 ways to promote your blog posts when you have no followers. Now you don’t have to do everything at once, pick one method and focus on it. Once you get the hang of it and start seeing results, you can then add another method into your blog promotion strategies. Consistency is the key here and don’t expect results overnight. The more time you put in, the more successful you’ll be. If it didn’t work, find out why. Perhaps you just need to spend more time with it or adjust your approach. 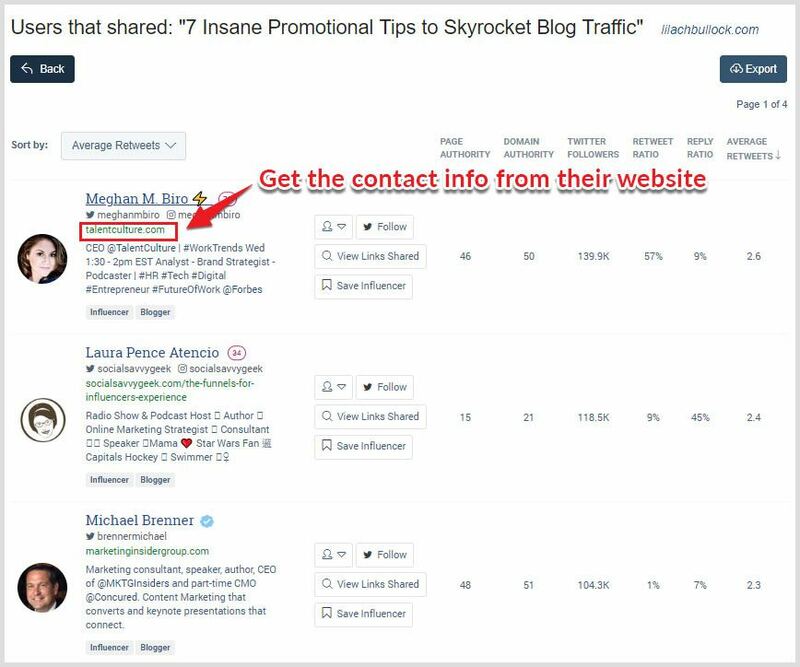 Are you using any other content promotion strategies? Feel free to share them in the comments below. Thanks you for these advices. I think I have work to do! Thanks. I hope it will help you in your promotion effort. Hey Victor, thanks for sharing! 🙂 I think I’ll finally have to get out of my comfort zone, reach out to other people and start networking. Thanks for the reminder. Good for your Claudia! Thanks for stopping by. Good tips, thanks for sharing. I especially liked your breakdown of the usefulness of social media sites. I think choosing which social media sites to focus on is important especially during the early days. Thanks for the comment Penny. Glad to know you find the blog promotion strategies useful Kelly. Thanks for reading! Great post and so helpful! Thanks! Thanks Amanda! Glad to know you find the blog promotion tips helpful. You’re welcome Steward. Checked your blog, it’s a nice one you got there. Anyway, nice to encounter a fellow Sabahan too! Great article. I’m bookmarking this so I can come back to it for reference! Thanks Kathy! I hope the tips can be of help in you content promotion. These tips are so useful! Thanks Dariana! Glad you find the blog promotion tips useful.